We visited Stratford Upon Avon today to go to The Butterfly Farm. It was a gorgeous sunny day, a little bit nippy but I was so comfy and cosy in my new Femme Luxe Finery jumper. It's this gorgeous bright mustard colour! I love it! It looks fab with my new skirt from Primark. It's a midi length pleated skirt with monochrome print. We loved the Butterfly Farm, Amelia really enjoyed it. We then had a spot of lunch and a walk along the river. We had a game of mini golf - I won!! Then sat on the grass and made the most of the weather! I'm super excited for summer but loving cooler days like today where I can still wear a comfy cosy jumper but don't need a coat and can have my legs out! When we think of travelling, we often only think about going somewhere with gorgeous weather so that we can spend our time relaxing on the beach. It doesn’t always have to be like that, though. If you want to be a bit more active, there are plenty of different ways to enjoy your time travelling. In fact, you might want to see how far you can push yourself by taking part in one of these epic travel adventures! If you want to ensure you get plenty of exercise still when you are on holiday, you could always go on a cycling trip. There are lots of cycling routes that go across central Europe, but if you would rather do one closer to home, why not attempt to cycle the length of the country? You can start at John O’Groats in Scotland and end up in Land’s End in Cornwall. Do you want to know how far is it from Land’s End to John O’Groats? Well, it’s quite far, but biking it will certainly be quicker than walking. Plus, you will feel like you have really achieved something at the end! Lots of people see climbing a mountain as a very worthy challenge, and this may be one travel adventure that you have set your eyes on. There are a few mountains to choose from. If you want an epic adventure, then you could fly out to the likes of Everest or Kilimanjaro. If they sound way too challenging, there are still some impressive ones to climb in Britain as well. Snowdon in Wales and Scafell Pike in North Yorkshire are two examples. For some people, going on holiday on their own is a big enough challenge. This can take a lot of self-confidence, but it will be very worth it indeed. You will be able to do exactly what you want to do, and won’t have to compromise to please anyone else. Not only that, though, but many solo travellers find that their confidence is given a big boost when they do spend time away on their own. Another great activity to try when you are travelling the world is trekking. This is just like hiking but on a whole other level! You will be trekking over some difficult terrain, such as over desert and through rainforest. But it goes without saying that you will see some truly spectacular sights and landscapes! If all of the above sound a little too active for you, you could always try out horseback riding. That way, you can see some equally fantastic landscapes, but you won’t have to worry about all the physical exertion! There is no better place to try horseback riding than in the regions that were known for America’s Wild West. Once you are there, you’ll be able to experience life as a cowboy and will have plenty of chances to go out on the horses. Which adventure will you pick? When you move into your first home it can be easy to get wrapped up in your new life and forget about some of the routine maintenance that you need to do to keep your home in good condition. As soon as you move in you should check your boiler. You can never be certain when the boiler was last serviced, and even if you are only using it for hot water, it could be dangerous if it needs attention. It is not explosions you should be concerned about, but carbon monoxide poisoning. This problem kills people in the UK every year, so get the boiler serviced straight away by a qualified engineer. Then make sure it is done again at the same time every year. Buy some window sealant and reseal all the frames. It does not need much of a hole in the existing sealant for water to seep into your home. There are different types available and you need to ensure you but the right one for your type of windows, but in the long run, this job that takes just a few minutes for each window, could save you a lot of hassle. If your first home has a conservatory you need to check the condition of it. They are a great addition to any home, adding another very useful room. However, they can lose a lot of heat in the winter because of the amount of glass and get too hot to use in the summer for the same reason. The answer to this problem could be a thermal conservatory ceiling, just like the ones at Rundle and Dorey. This would make the conservatory useable all year round and then you will feel the benefit of the extra space. Unless you have a pair of ladders when you are viewing a property, it is not always possible to look at the state of the gutters. This is quite a simple job to do but can save you getting watermarks on the outside and inside of your new home. Often, wearing a pair of rubber gloves and pulling any debris out is enough, but if there is a lot, you may find a trowel helps. Then run some water through them with a hose. Not a great deal is needed, just enough for you to see if the gutters are leaking anywhere. If they are, get them repaired before they can cause any damage. This is another job you should do every year and possibly twice a year if there are a lot of trees in the location you live. Paintwork that is peeling does not only look shabby, it means the paint is not providing the protection to the wood underneath that it should. Any areas that are small just sand, prime and paint, but if there is a large area, it is probably worth doing the whole affected wall. Routine maintenance does not have to take a lot of time or cost a fortune, but can save you both of those things if you keep your property up to scratch. There’s no denying that soft furnishings can help elevate the look and feel of a room in an instant - but how do you style these accessories? For the inside intel on how to incorporate soft furnishings into your home, keep reading. Did you know that cushions can help enhance almost any space in your home? So, if you’re keen to really step up your interior game, you might want to think about introducing these soft furnishings to your rooms. For example, you could turn your sofa into a comfy, cosy haven by throwing a few fluffy cushions into the mix, or create the ultimate sleep sanctuary by scattering some snuggly versions on your bed. The good news is, you can purchase cushions in just about any shape, size and colour, so you shouldn’t struggle to find accessories that complement your decor theme. For instance, Crown French Furniture offer a wide selection of cushions in a variety of prints and materials, from sophisticated plain, silk designs to versions with cute checkered, tweed covers. If you have a room in your home that feels like it’s missing something, why not add a rug? Adding one of these to your floor is the perfect way to add depth and warmth to any space. Whether you lay one down in front of your fireplace or in the middle of your bedroom, rugs can also help serve as a focal point for the room - especially if you go for one with an interesting design or a bright, vibrant colour. A rug can also help revive a less-than-perfect floor. For example, if you have hardwood floors that are looking a little shabby, a rug can help deflect from this, and in turn, totally change up way you perceive the entire room. To create a space that exudes luxury and sophistication, you can’t go wrong with an elegant throw. These soft furnishings allow you to add texture to any room, whether you drape one over the arm of a chair in your living room or you add one to the foot of your bed, making the area look and feel more cosy and inviting in an instant. From intricately detailed fine-knit styles to sumptuous faux fur designs, you won’t struggle to find a throw that perfectly suits the intended space. How do you style your home with soft furnishings? Share your tips in the comments below! Light is the absolute essential if you plan on making your home feel modern and spacious. 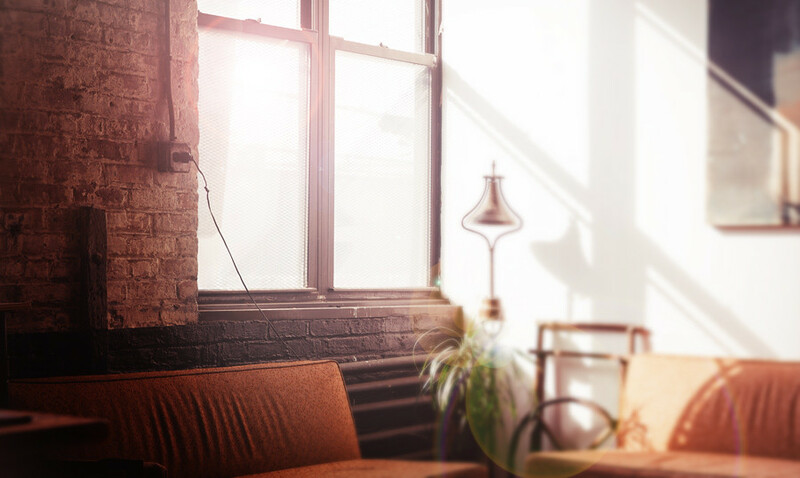 Natural light is wonderful and it makes a home feel bright and much more happy than a small dark space. If you don’t have the best windows in your home at the moment now is the time to get busy and update the windows to make them feel more in keeping with the rest of the house. Light can also be added with cool white light bulbs around the home as well as decorative lights such as lamps and fairy lights. If you want to update the home to feel more open and modern there is one place in particular which you will need to make some changes: the floor. Even though you might not realise it, your flooring has a massive impact on the way your home looks and feels and it can lead to the home feeling old and small depending on the type of flooring you have. Polished concrete is a wonderful idea for a modern home because it increase the space you have and you can have the floor varnished in a marble design to make it feel like luxury. Because the colour schemes for modern homes are usually fairly simple and plain, the thing you will want to do in the home is to mix up your textures. You could for example have a rug on the polished concrete for effect, a fluffy throw hanging over your sofa, a wooden decorative panel on the wall… have fun playing with different materials and see what you can come up with for the room. Make sure however that the materials you layer are the same colour, just different tones of that colour. This next tip can be great whether you are making your home cosier for the family or if you plan to go into airbnb management and rent out the space for some extra money. Candles, cushions, blankets and vases of flowers are all of the things you will want to bring into the home at the end of the day to make it feel more like a family home than a house. Because modern homes are made so simple, you can really go to town here and make sure you have as many different home comforts as you possibly can in the house. If you have finally reached the point where you are able to buy your very first home, then you will understand how exciting this can be. The problem is that you probably have to buy every single furniture item before you move in, and this can be incredibly expensive. You’d probably love to furnish your home with brand new items, but you have to remember that this is not a realistic option. You need to save as much money as you can and one way for you to do this would be for you to take inventory of what you have right now. If you are moving in with someone else, then you need to take stock of the inventory that they have as well. If you have a couple of household items that your family are willing to give you then you should also write these down. This can take a while, but it will save you a small fortune in the future. for furnishings when you move in. You can make some costly mistakes here, so it is important to furnish your home with one item at a time. Sure, you will want to have a few essential items such as a bed, a dresser or even a dining table but everything else can be sorted out as individual pieces. Keep in mind that there are so many ways for you to furnish your home without having to focus on high-end items. In fact, you can probably buy most of these items second-hand and save a ton of money. Search out any thrift shops and also try and find some consignment stores in your area as well. Pay attention to the postal charges too, as this can easily add up the total cost. If you are choosing to shop at flea markets then this is great, but do make sure that you give the items a good look over to make sure that they are sound and that nothing is missing. If you don’t want to buy second-hand items but want to get some great deals, then Bentley Designs furniture are the way to go. If you are struggling to find certain items you need then you can easily opt for financing options. When you buy something on finance, you will be paying out a set amount every single week and you can get any item you want. When you do invest in finance, you have to make sure that you get a good deal and that you are also happy with the payment terms. Interest rates can vary and if you are on a budget then you have to make sure that you get the lowest one possible. Of course, there are plenty of ways for you to furnish your first home, and when you take the above into account, you can be sure to get the whole job done with ease. A house renovation is going to take a lot of potential quality time out of your home, and that means you’re going to have to tidy up and prepare for it accordingly. Sure, you’ve going to be getting a new and improved living space after all the work is over, but you don’t want any of your possessions getting damaged in the process. All in all, that’s going to make the entire ordeal a lot more expensive. So, if you’re someone who has no idea where to start with clearing out your rooms, and you’ve got the workmen coming round tomorrow morning to get started, here’s a quick checklist to help you out. Why not grab yourself some boxes before you start to make the removal and transportation easier, and then get a sharpie to note down on the box what’s inside! The pictures and paintings lining your walls aren’t going to be safe enough to stay up there - not whilst potential masonry pieces and flecks of pain could be falling all over them. So you’re going to need to strip the decorations you’ve got around the room that’s being renovated, even if it’s just a certain half of the room that’s changing, or you’re just getting a new carpet fitted. Next up is to lay some protective coverings over the floor that’s going to be worked all over, and you can never be sure the company you’re using to renovate your house is going to do so for you. Usually this is standard practice, but be sure to ask if that’s something you’re worried about! But apart from that, you’re going to want some sheets in the other areas of your home that are going to receive some heavy footfall over the next few days or months. Workmen boots can be caked in all kinds of wet materials and dried off flakes of old paint and plaster - you don’t want that mess spreading throughout the rest of your home. The final point is to make sure you’ve got a good system for removing and keeping your possessions safe. You want to know you can immediately get all the right things back into the right places, to be sure your life and home atmosphere won’t be disrupted for any longer. Think about what would be most practical here. If you’ve got a garage that has a bit of room to it, great. But if that renovation work you’re about to go through is quite lengthy, as an extension or a conversion tend to be, then look into some professional remove and store companies to help you out. House renovations can be quite hefty to live with, so make sure you’ve got the space all ready to go in advance. It’ll make the recovery easier too! Beauty and fashion are great. There’s no denying that spending some time trying out different make-up tutorials, shopping for different outfits, and seeing what new beauty products you can review this week, can be really fun. One thing about most conventional beauty and fashion techniques and products, though, is that they pretty much only do one thing – make you look better. Now, that might seem like an obvious point, but there are actually plenty of things you can do that will help you to look your best, while also improving other areas of your life as well. So, while you should, by all means, continue to buy moisturizer, and dresses that rock your world, here are some other tips that you should think about trying out as well. If you’re anything like most people, you probably spend your evenings surfing the web obsessively, catching up on your Netflix binges, and going to sleep later than you know you should, for the sake of getting a few more precious moments of relaxation before getting up for work the next day. Here’s a different suggestion, though. How about you start turning your evenings into personal relaxation and pampering sessions instead, go to bed earlier, and wake up earlier too? Studies consistently find that people who wake up earlier are happier, healthier, and more successful than people who stay up late. Not only that, but it’s well known that being too active in the evening, and staring into many screens, disrupts your sleep. By turning your evenings into pampering sessions, complete with candles, hot baths, music, and some quiet reading, you’ll be able to enjoy much deeper sleep. This has also been shown to improve health and physical appearance. After all, the phrase “beauty sleep” isn’t famous for no reason. These days, more and more people don’t move around enough during the day. And that’s not just to say that not enough people are getting down to the gym, either. Recent studies have actually found that if you spend too much of your day sitting down, you’re actually bound to be less healthy overall, even if you do make it to the gym after work. Walking doesn’t get much respect as a form of exercise, but it improves circulation and helps the cardiovascular system, which means you’ll have a better complexion, and enjoy more feel-good endorphins as well. For extra points, spend more time walking in nature. Fresh air like you find in forests is extremely healthy, and people who spend more time in nature are said to be happier and healthier too. The food writer Michael Pollan is pretty well known these days for his hit Netflix show “Cooked”, where he investigates traditional cooking techniques throughout history, and around the world. He’s got a pretty good approach to dealing with a lot of modern health issues. He thinks that everyone should get seriously into home cooking, and eat almost nothing but home-cooked meals. A lot of serious nutritionists and dietitians agree with him. Processed food is known to be unhealthy, and can age the skin, and cause issues like chronic inflammation. By getting in touch with your inner chef, you’ll not only be able to enjoy delicious meals every day, but you’ll also look and feel better too. Green is by definition a fresh and soothing colour that can not only put a smile on your face but also makes you feel a lot of centred and relaxed. However, painting your walls green is not always a favourite option. For a start, if you’re in a rental property, you probably don’t have any say about the wall colours. But even for homeowners, a green wall can clash a little too much with their interior style. Consequently, if you’re after green alternatives that don’t force you to redo your decor completely, you need to focus your attention on nature-friendly or nature-inspired solutions. Are you a cottage garden lover? For homeowners, the ideal home comes with a garden. However, long working hours at the office and hectic commute can dramatically reduce the time you can spend in your garden. A garden that is left unattended can rapidly turn into a potential risk for your household. Indeed, overgrown gardens can encourage pest invasion, while gardens that stay muddy throughout the year facilitate flooding. In short, if you’ve got no time to maintain your outdoors but still want some fresh green, take a look at these trade artificial grass solutions. Nothing beats a natural looking lawn that takes no effort! If you’re enthusiastic about gardening, you can reduce lawn maintenance to a minimum by growing flowers instead. Even if you’ve got a brown thumb or you lack time, you can choose flowers that are ideal for your lifestyle. Marigolds, for instance, grow quickly and bloom in spring, summer and fall, keeping your garden colourful almost all year long. They’re also super easy to look after! Pansies are another solution to add colours to your winter garden as they can survive mild winter temperatures. And finally, planting daffodils will give you delicate flowers in late winter. In short, if you prefer a wildlife-friendly garden without too much maintenance, these easy flowers are a must-have! You don’t just love to watch your greens; you want to eat them too! If you’ve never grown vegetables before, it’s a good idea to start with salad greens as these are easy to harvest and can even grow in containers. Tomatoes are hugely popular, but they’ll need a greenhouse to become red and juicy. If you prefer roots, try carrots and radishes which can grow through most British soil and can sustain cold temperatures too. You’ll find your meals taste all the more delicious when they’re prepared with your homegrown harvest! Or do you prefer greens to harvest? Tenants can plant flowers and vegetables in their garden, although it’s worth checking with your landlord. However, when you live in a flat, you need to overcome practical challenges to bring your greens at home. Have you considered a flower subscription to receive beautiful bunches of flowers regularly? If you prefer plants you can grow at home, you can create an indoor garden using hanging baskets and pots. Green is a strange colour to accommodate in your household. When you want to make the most of its mood-elevating and health-enhancing features, you need to think of green in terms of gardening and harvesting. But nothing is impossible if you set your mind to it! From artificial garden to houseplants, you can surround yourself in green!